There's a big lesson for progressives in Tuesday night's results. Doug Jones, a progressive Democrat in a ruby red Southern state, did something that few believed possible: he won a statewide election in Alabama. What’s more, he’s a white man who went out of his way to court black voters and then afterwards, to praise them for his victory. That’s a major political development, one that upends the mistaken narrative some Democratic leaders foisted on supporters in the wake of the political drubbing suffered in 2016. Remember that “Better Deal” nonsense, the idea that white working-class voters were the hope for progressive success? Nah, I didn’t think you did — certainly not after Jones’ victory. As my colleague Kira Lerner discovered in her conversation with Birmingham resident Blair Liggins, black voters will turn out and vote in huge numbers if given a reason to do so. “Everyone automatically thinks that with a Democratic candidate that you’re just going to get the African American vote, and I really believe that Doug Jones did not just take that for granted,” Liggins told her. The reason is simple. Voting is an act of hope. Black voters, like all others, will respond to a forward-looking candidate who approaches them with policies that they believe will benefit them and their families. By nearly all post-election assessments, the difference in the outcome of Alabama’s special election was massive and unexpected turnout among black voters that swung overwhelmingly for Jones. 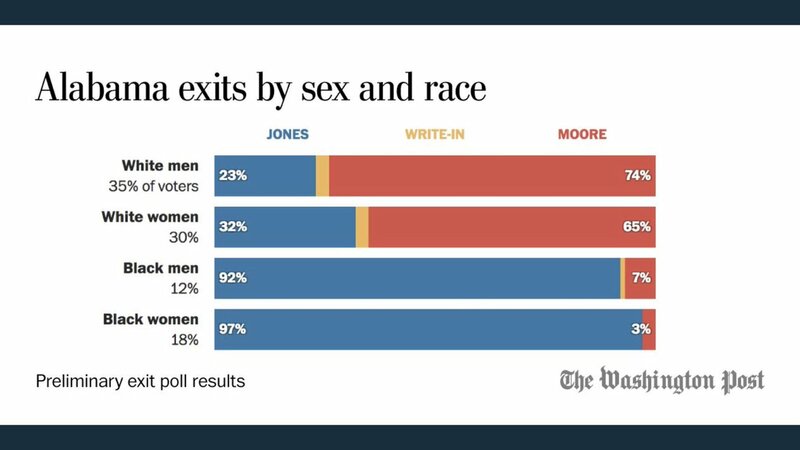 Exit polls published by the Washington Post makes a clear and compelling case: 98 percent of black women in Alabama voted for Jones; 93 percent of black men voted for him. But the way they voted wasn’t the most remarkable or decisive aspect of the election. It was how many of them showed up. African Americans account for roughly one in four residents of the state, but they rarely vote with an intensity that corresponds to their population. This time, in an off-off-year special election, black voters showed up to represent nearly one in three (roughly 29 percent) of all voters in the state, according to the Post’s exit poll figures. This was no small feat, as Alabama is among the most conservative, crimson-colored states in the nation and Jones is a demonstrably liberal Democrat — he supports a woman’s right to choose, believes in climate change, advocates for LGBTQ rights, and has a history of civil rights activism. That’s a shocking set of ideals for any candidate to hold in the nation’s most conservative region, and it ought to serve as a values-studded roadmap for other progressive politicians to follow. Apparently, a great number of Republicans agreed with Shelby and refused to support Moore. A post-election analysis by The Atlantic’s Van R. Newkirk II noted that Moore under-performed in many of the state’s predominately white counties. To be sure, Moore was an especially vile candidate. Moore’s campaign, once considered a shoo-in because of his ardent support among far-right voters and the state’s historic distaste for Democrats, became undone after several women accused the former chief justice of the Alabama Supreme Court of sexual abuse when the women were teenagers. The allegations prompted many state and national Republicans to distance themselves from Moore. President Donald Trump, on the other hand, jumped into the race and threw his support behind Moore, a move that now seems to have added fuel to the simmering fire underneath black voters in Alabama. In the end, however, Jones’ camp benefited from the confluence of anger at Trump and the energetic, if overlooked, get-out-the-vote effort to send African Americans, women, and disgruntled Republicans to support the Democratic nominee. In particular, Jones leaned in on his civil rights record with an effective advertising campaign that included media ads and billboards across the state that highlighted his successful prosecution of two KKK members in the 1963 bombing of the 16th Street Baptist Church in Birmingham, a watershed moment in the civil rights struggle. Jones also tapped into a network of local and national Democratic groups with close ties to black Alabamians. Fearing a weak turnout might hurt Jones, party leaders arranged for high-profile black lawmakers, celebrities, and activists to campaign for Jones. President Barack Obama did robocalls. Sen. Cory Booker (D-NJ) barnstormed the state to turn out black voters in Tuesday’s special election. And, locally, Rep. Terri A. Sewell (D-AL), the state’s only black member of Congress, organized a set of get-out-the-vote events last weekend that included civil rights icon Rep. John Lewis (D-GA), who marched for voting rights in Selma and was beaten by police. Not to be forgotten, Virginia voters sent a similar message to the nation last month, as Democrat Ralph Northam defeated Republican Ed Gillespie, a candidate with Trump’s last-minute backing, to become the state’s next governor. Establishment candidate Ed Gillespie lost. Non-establishment candidate Roy Moore lost. The lesson: A base-only POTUS isn’t enough for gop to win. Ds hate Trump more than Rs love him. POTUS needs to increase his approval rating or D turnout will kill Rs in 2018. Pay attention! Across the nation, progressive candidates won last month and again last night in Alabama, portending a blue wave as we round the corner into 2018 and the midterm elections. It’s a brand-new day, America, when an exuberant Dixie politician thanks black voters for providing his margin of victory. That’s something every progressive politician, policymaker, or voter across the nation should heed: the key to victory in the age of Trump goes through black voters.